It's quiet out there for FX traders, almost too quiet. Or is it? Certainly not if one trades LatAm, the Turkish Lira, the South African Ran or the Chinese Yuan for that matter, whose record plunge continued overnight. 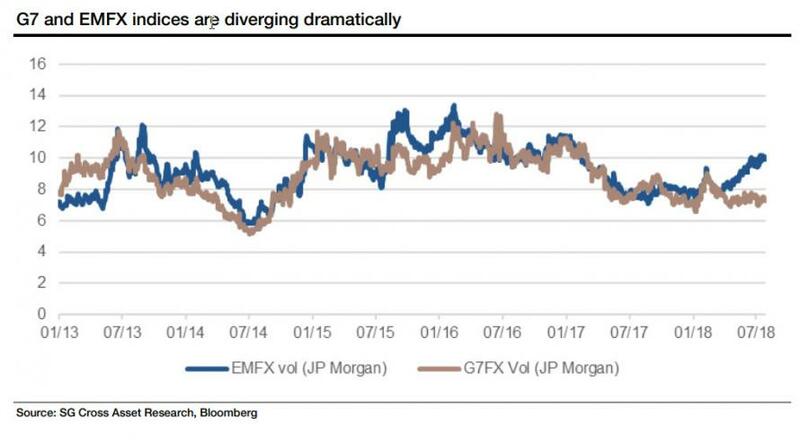 This is the observation made by SocGen's FX strategist Kit Juckes who shows a chart from JPM comparing EM and G10 volatility indices, which he says "are diverging in a near-unprecedented way." Juckes adds that "this is a very interesting period for FX markets, just not for G10 currencies." Jason Daw and Kiyong Seong wrote an EM Strategizer this morning, noting regional bearish yuan sentiment. This keeps pressure on Asian currencies, provides support for the dollar, and keeps EMFX vol elevated relative to G10. Of course, the question is what happens next, and which way does the gap close: will G10 FX vol follow EMs higher, or vice versa? In light of the quantitative tightening taking place - and accelerating - among G7 central banks amid accusations of currency manipulation by President Trump, and the escalating trade war between the US and China which represents the nexus of G10-EM currencies, should trade tensions not ease in the coming weeks, the most likely outcome is that the vol EM traders have been enjoying for the past few months will slowly but surely spillover and affect the rest of the world with adverse results, as FX vol "contages" all other asset classes which despite some vol hiccups in recent months, continue to enjoy a world in which every volatility spike is quickly forgotten.